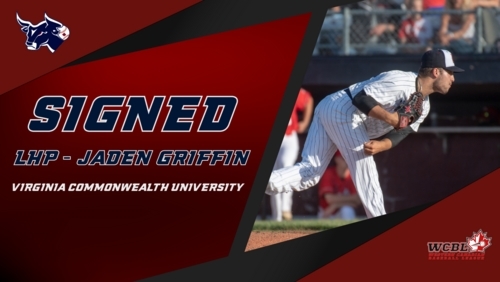 LETHBRIDGE, AB - The Lethbridge Bulls have continued shaping their roster ahead of the 2019 WCBL season, announcing the signing of returning player, LHP Jaden Griffin out of NCAA Division I school, Virginia Commonwealth University (VCU). Griffin, a freshman, had a strong season a year ago and emerged as one of the Bulls top and most consistent starting pitchers, posting a 3.19 ERA, while striking out 28 batters in five starts for the Bulls. "It's great to have Jaden back, I'm really excited because he's a real comepetitor. He was one of our most consistent guys last year. He led our team in ERA, but we never gave him run support to get those wins. This season, we're going to have some real good bats, so that will change," said Bulls head coach Jesse Sawyer. "He's one of the top lefties in the league. There's a reason why he plays division one baseball in the States," Sawyer added. 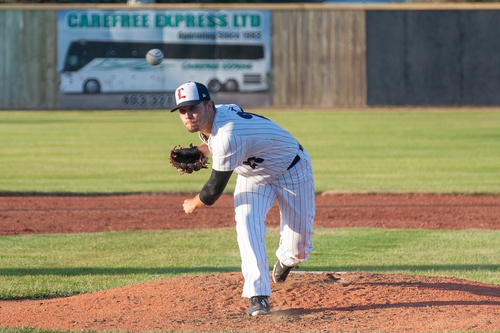 The former Vauxhall Academy of Baseball standout started the 2018 Home Opener against the Okotoks Dawgs and gave fans something to cheer about despite a dissapointing loss, throwing seven innings, and striking out eight on the day. "I'm excited to come back because it's a great atmosphere playing for the Bulls, not only the fans, but playing baseball with guys you just met and guys you've known for years, it's just a great experience. I knew I had to come back for another season after making some appearances last year and loving it," said Griffin. "I'm still a young player, but I like to think I bring some experience, just because of my past and recent experiences playing baseball. I feel as though I can bring some extra experience and good eneregy to the team," he added. Griffin joins teammate, RHP Evan Chenier on the Bulls next season, as the two play College baseball together with the Virginia Commonwealth University Rams.